Instead of reserving its details for a full announcement, Microsoft on Tuesday night tipped its hand early and provided some preliminary but important details of the new player. 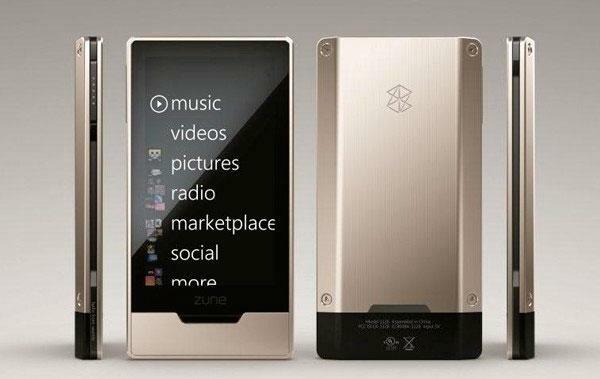 All but confirmed as early as April, the Zune HD will finally drop physical buttons in favor of a touchscreen display. Microsoft's will be slightly lower-resolution than Apple's —480x272 instead of the iPod's 480x320 —but, according to what was told to Engadget, will be slightly smaller than Apple's at 3.3 inches diagonal and, in a more obvious break, will use OLED (organic light emitting diode) technology in place of LCD. The newer approach produces richer colors and, since it doesn't need a backlight, produces true blacks while simultaneously consuming less battery life. Multi-touch will indeed play a role, but Microsoft wasn't keen to say what features would be enabled. It quickly shut down rumors that Windows Mobile might lie underneath and instead said it was using a very extensively modified version of Windows CE. As suggested by the name, HD content will play an important part in the new Zune, though not as elaborately as alluded to in rumors. HD video will require a new dock and can't be played on the Zune itself. Microsoft also claims a particular first in its use of HD Radio: the Zune HD will be one of the first handheld devices with an HD Radio tuner, which should support digitlal-quality broadcasts on sub-channels of the FM band. In step with the new freedom afforded by a touch display, the new player will do more with its Wi-Fi than just download from the Zune Marketplace or "squirt" songs to fellow Zune owners. Microsoft says it has developed a customized version of Internet Explorer made just for the Zune HD that hinges on touch for navigation. The Redmond, Washington-based electronics maker also revealed that it intends to push the Zune name far deeper into its line than before. At next week's E3 gaming trade show, Microsoft intends to replace the Xbox Video Marketplace with a Zune-labeled service. Although it wouldn't say so explicitly, Microsoft implied that movies and TV shows from the Xbox 360 may port over to the Zune, or vice versa. Microsoft wouldn't elaborate on games, either, but did hint at touchscreen-aware games and similar apps. Zune HD devices will ship in the fall to Canada, Europe and the US, but won't completely oust the existing Zune lineup; it's mostly the smaller flash players that will make their exit when the new hardware arrives, Zune's general global marketing head Chris Stephenson told CNET. Capacities, prices and many of the other more concrete details weren't provided, but the Zune HD will be the "definitive" Zune. Whatever its ultimate place among Microsoft's own line, the firm makes no bones about what the Zune HD's role will be in the market: it's "created to go head to head" with the iPod touch, Stephenson said. Where smaller competitors like iRiver and Samsung have had their own touchscreen devices for months or more, Microsoft has gone without its own in the roughly 1.5 years since the iPod touch first hit the market —a factor which has helped maintain over 70 percent market share in the US for iPods and a $100 million plunge in Zune revenue from late 2007 to late 2008. Combined with a new anti-iPod ad campaign for the Zune Pass unlimited subscription music service, the Zune HD signals a renewed interest on the part of Microsoft, which has been making noise about touch computing in Windows 7 and Windows Mobile but, without even a single-touch Zune to its name, has almost exclusively been left by the wayside in the handheld device space.